We're not gonna kill you, we're not gonn hurt you. You're gonna rot in a cell. We're not gonna kill you, we're not gonna hurt you. You're gonna rot in a cell. 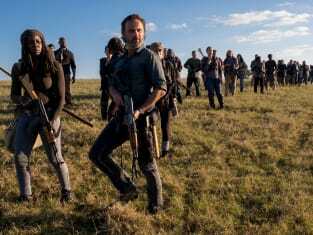 The Walking Dead Season 8 Episode 16: "Wrath"
We are cleaning house today, Rick! Permalink: We are cleaning house today, Rick! Negan: Are you sure that's something you want to see? Eugene: More of a need to thing. Negan: Well, look at you. Permalink: Well, look at you.